Sunny and hot or chilly and wet, are you ready to play lacrosse? Let your JoeShade® portable lacrosse umbrella keep you protected watching your favorite game! Having fun at a pre-game party or a post game celebration we may forget the need for sun protection from harmful UV rays. 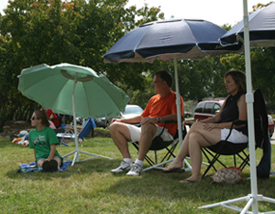 Set up a JoeShade portable lacrosse umbrella so team players and fans can catch a break from the sun. Its carrying bag has a convenient shoulder strap, making it easy to carry with you to your favorite spot in the parking lot. Order your JoeShade umbrella today and make your lacrosse game complete!